Safety Not Guaranteed had me intrigued from the moment I first read about it. A small indie film that’s plot revolves around a group trying to find the person responsible for a classified ad regarding time travel, a quirky premise. The fact that it stars both Mark Duplass and Aubrey Plaza, both of which I thoroughly enjoy in The League and Parks and Recreation respectively, was just a bonus. Did the film’s story deliver on its potential? Or did it make me wish I could travel back to the moments before watching? The film begins with a story conference for a magazine based in Seattle, where Jeff (Jake Johnson) a writer, brings up the classified ad. “Wanted: Someone to go back in time with me. This is not a joke. You’ll get paid after we get back. Must bring your own weapons. Safety not guaranteed. I have only done this once before.” Jeff thinks it would be fun to find whoever put out the add and see if they are serious. To just write up a comedic throwaway piece for the magazine. To do this he takes two interns, Darius (Aubrey Plaza) and Arnau (Karan Soni), to help him on the assignment, and then they’re off. At only 86 minutes the film has a brisk pace that helps keep you invested. It is not long before the team is able to find the creator of the ad, a man named Kenneth (Mark Duplass) who Darius soon befriends in an attempt to get closer to and figure out if he is truly crazy or not. 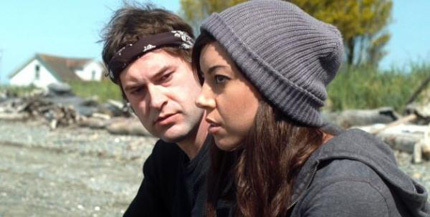 The vibe of Safety Not Guaranteed is that of many similar indie films, relying on character, drama and small bits of humor peppered throughout. It’s lucky then, that the small cast of actors play so well off each other. Each of these characters have small arcs that play out fairly well, and each are just normal people that have doubts and fears and each desires to find something better in this world, if even for just a few days. The central quest to discover if Kenneth is a sane man who truly has found a way to travel in time, or just a man who is deeply flawed, is fairly well done. The chemistry between Duplass and Plaza is the heart of the film, and watching their characters open up to one another is a bitter treat. The ending came fast and I was slightly blind-sided by its conclusion, but even so, watching these characters proved to be a fun time, even if I wasn’t exactly thrilled with the final moments. I’ll watch anything with Aubrey Plaza, even if it is a boring, dull movie like this one. I never said it was boring or dull.